Since launching AutomateWoo in July the plugin has evolved considerably and now 2.0 is out! You’re probably already be aware of some of the new features and improvements that have been introduced since launch but I wanted to do a bit of recap and a summary of whats new in version 2.0. You can now send plain text emails which can be a great way to make your emails more personal. There is also support for developers to create custom templates. 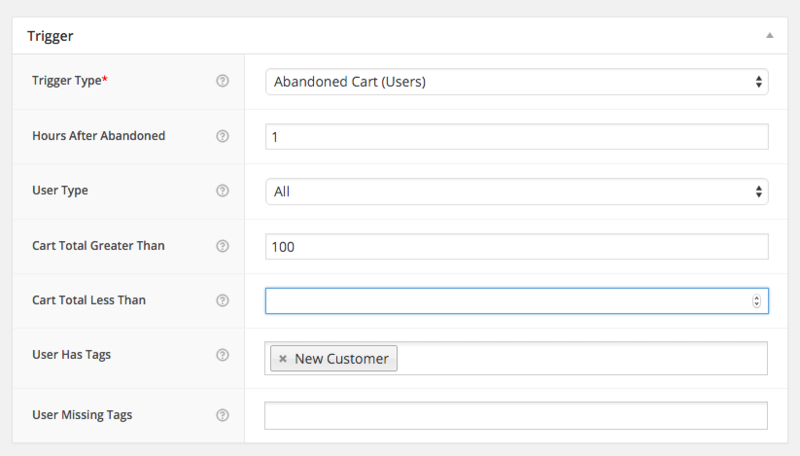 You can now enable purchase conversion tracking on any workflow, previously it would just work with abandoned carts. Please note after updating you will need to manually enable this to keep conversion tracking working for abandoned cart workflows. This is fairly high level feature that enables more workflow complexity and lets you chain different workflows together. You can also manually manage tags with a typical WordPress taxonomy view. I’ll go through some use cases in a future post. I’ve added some new options to target carts based on their total (e.g. create a special offer for carts over $100). Also there is a new report than shows you currently stored carts. Order related triggers have received an upgrade. The Order Status Changes trigger now lets you select a from and to status. This trigger also has support for custom order statuses. There is also a new trigger User Order Count Reaches. There a few new options that let you target orders for specific countries or orders that used a certain payment method. The Once Per User checkbox has been changed to Limit Per User. 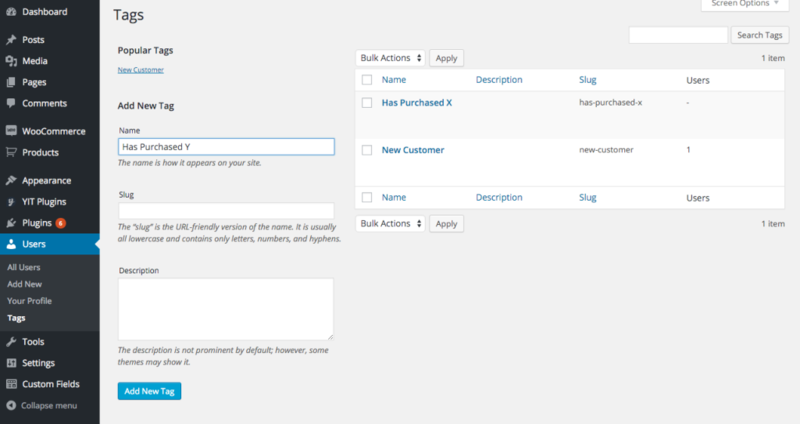 Trigger to target orders that include a specific variation attribute and there is also support for custom taxonomies. E.g. if a customer purchases a product from a certain brand you could add them to a list on MailChimp. 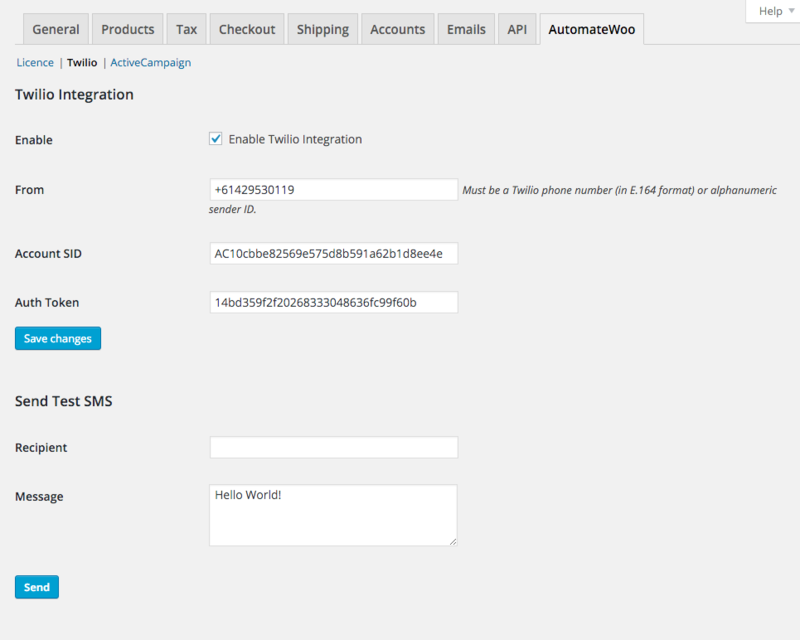 Introduced in 1.1.9, sending SMS to customers or store managers can be used as an action with any trigger. A Twilio account is required. 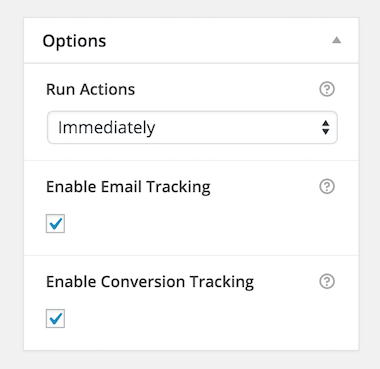 ActiveCampaign Integration (including actions to add and remove tags from contacts). 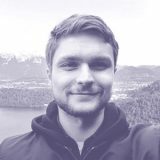 Unlike previous integrations ActiveCampaign API details are managed in WooCommerce settings level rather than on the action level. This will be typical method going forward and previous integrations will be updated soon. There is a new trigger ‘Workflow Times Run Reaches’ use this in combination with new ‘Change Post Status’ action and you can automatically disable a workflow after it runs X amount of times. You can also use ‘Send Email’ to notify your self when this happens. This is of course a free update and you can get it as you would update any standard WordPress plugin on your website.